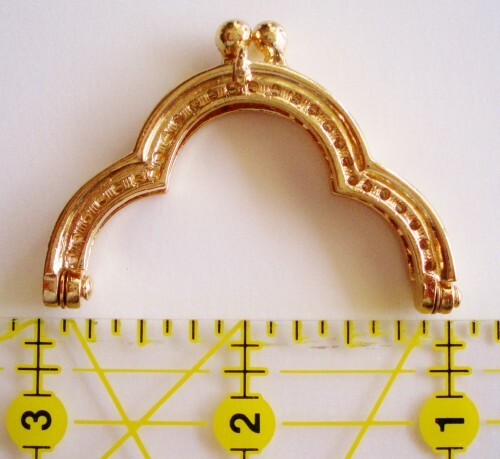 This purse frame is a reproduction of a vintage frame. 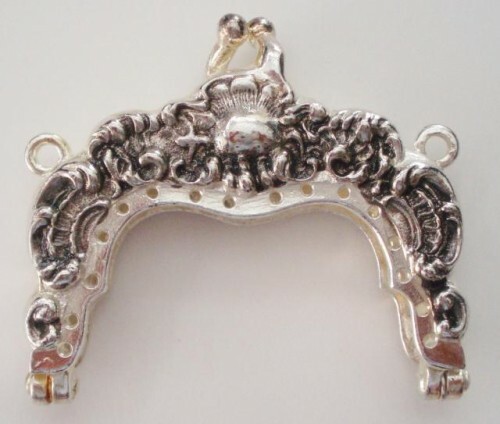 It is very heavy sterling plated. It is designed to be used with beadwork and I think is best used for bead knitting or crochet. It is about 2 inches wide and is almost 1 3/4 inches high. It is antiqued and is absolutely wonderful. I have a very sweet bead knitting pattern that I'll enclose free with this selection. 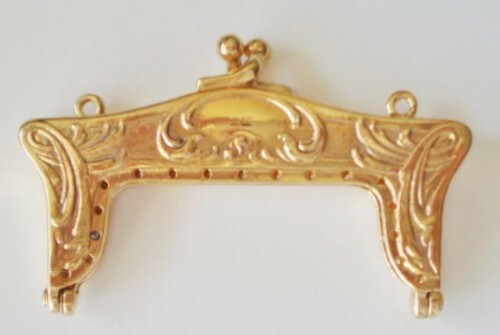 This purse frame is a reproduction of a vintage frame. It is very heavily plated and is designed to be used with beadwork and I think is best used for bead knitting or crochet. It is about 3 inches wide and is almost 1 1/2 inches high. It is antiqued and is absolutely wonderful. I have a very sweet bead knitting pattern that I'll enclose free with this selection. Look, I know I am not a great photographer. I do my best but this photo does not do this frame justice. No matter how I try I get a reflection that looks dark. I promise that is not on the frame. It is a bright, beautiful gold color. 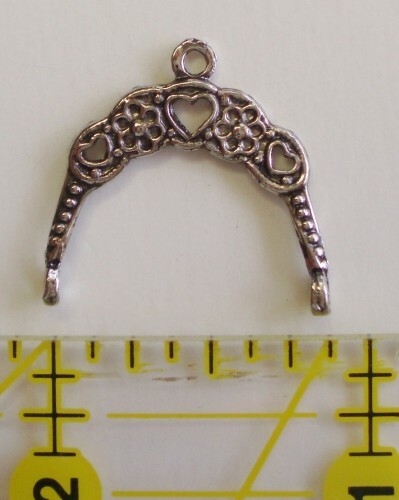 This purse frame is a reproduction of a vintage doll purse frame. It is very heavily plated and is designed to be used with beadwork and I think is best used for bead knitting or crochet. It is about 3 inches wide by about 2 inches high. Look, I know I am not a great photographer. I do my best but this photo does not do this frame justice. No matter how I try I get a reflection that looks dark. I promise that is not on the frame. It is a bright, beautiful gold color. This frame will make the sweetest dolly purse ever. 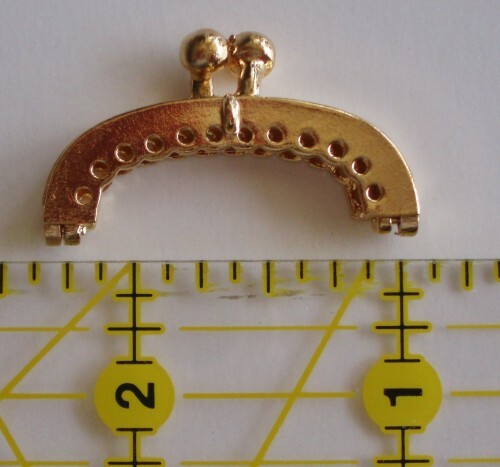 This purse frame is a reproduction of a vintage doll purse frame. It is very heavily plated and is designed to be used with beadwork and I think is best used for bead knitting or crochet. It is about 1 1/4 inches wide about 1/2 inches high. Look, I know I am not a great photographer. I do my best but this photo does not do this frame justice. No matter how I try I get a reflection that looks dark. I promise that is not on the frame. It is a bright, beautiful gold color. I have a very sweet bead knitting pattern that I'll enclose free with this selection. This frame is designed to be used with beadwork and I think is best used for bead knitting or crochet. It has three tiny hearts cut out of the frame for a really nice effect. It is about 7/8 inch wide and about 7/8 inches high. This frame is only one part. If you want to make a purse that actually opens (and you could) you will need two pieces. I have a very sweet bead knitting pattern that I'll enclose free with this selection. It can be made as a necklace/pendant or a very small dolly purse.